This post was published on the Ms. Magazine blog on March 24, 2015. When you hear the words investigative journalist, what images spring to mind? Do you think of surly men in brown fedoras, carrying spiraled notepads with pens behind their ears? How about a 19th century, high-collared, petticoat-wearing woman? It may surprise you, but that’s exactly who pioneered the field. 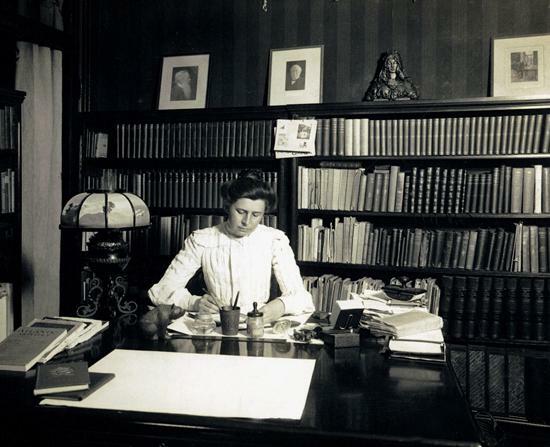 Ida Tarbell was the preeminent ‘muckraker’ of her time (although she resented the term). Praised for her crack-nut investigative reporting skills and eloquent ability to turn a phrase, she was a popular writer who brought down one of the most powerful men in the country, John D. Rockefeller. Tarbell was a vanguard in many aspects of her life. She was the only woman in her class year at Allegheny College, where she studied biology. Her family had welcomed feminists and pro-temperance activists into their home, such as Frances Willard, which led Tarbell to support the women’s suffrage movement. And she early on decided she would forgo wedded bliss to pursue her career dreams instead. Like many women in that era, Tarbell became a teacher first but didn’t enjoy it. She quit after two years to pursue the written word instead. Her abilities were soon noticed and she became the managing editor of The Chautauquan in 1886. Then in 1890 she left everything and relocated to Paris to study and write about the lives of historic French women. She became well known and respected for her profiles, including a long series she wrote about the life of President Abraham Lincoln for McClure’s Magazine. But Tarbell’s biggest success—and what she is memorialized for in U.S. history classes today—came when she wrote a 19-part series for the magazine on the history of John. D. Rockefeller’s Standard Oil Company. When she was 14, Rockefeller had driven her father’s oil company out of business. Clearly the experience had stuck. Tarbell spent two years investigating the company before her first article was published in 1902. She exposed Standard Oil’s unscrupulous practices and also wrote a biting portrait of the man behind the business. Her work helped lead to the prosecution of the company under anti-trust laws. But her life story takes an unexpected twist. Though initially a supporter of feminism and women’s suffrage, Tarbell altered her tune and began to advocate that a woman’s place is in the home. Suffrage supporters felt betrayed and Jane Addams and Helen Keller even criticized her for the apparent about-face. Historians question whether Tarbell began to begrudge the fact that she never married and had children, or whether she was always ambivalent on the question of women’s place in society (perhaps she even believed she was the exception to the rule). Nevertheless, regardless of her personal beliefs, she proved that women are more than capable of producing top journalism and even changing the world. So we remember Tarbell today for her innovative work (and perhaps we hope that if she were alive today, she may change her mind yet again). The National Women’s Hall of Fame inducted Tarbell in 2000. The year before, New York University recognized her reporting on Standard Oil as among the 100 top works of American journalism in the 20th century; she was ranked number five.